Responsiveness: One of the most important indicators of a good vending machine service company is how quickly they respond to your request for service. Having to leave multiple messages or long delays in responding to your call may be a sign that it’s time to change service companies. Helpful, friendly employees: When interacting with the service company employees, are they happy, helpful, and friendly? Do they answer your questions and concerns truthfully and sincerely? Friendly, happy employees can indicate that the service company is a good one. Satisfied customers: When choosing a service company request references. Just like happy employees, happy customers are always a good sign. Product and service options: A quality vending service company will have a variety of both service and product options. Delivery/refill times that fit your schedule, soda and snack products and brands that your customers request, and repair/billing options (such as hourly rates, flat rates, or regularly scheduled maintenance rates) should all be available options. Other (more subjective) suggestions: While not always as definitive, there are other things you can consider when making your choice. What does the service company’s website look like? Does it look professional and informative? How high in the search rankings/list is the website found? Higher-ranked websites tend to have more visitors, often indicating a higher quality of content. Finally, how do you feel when talking to the prospective service company? Did you get the impression the employee was listening to you and interested in gaining your business? 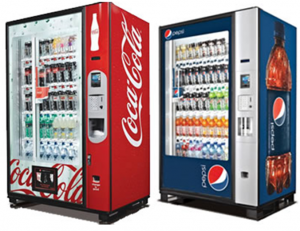 Choosing a service company for your vending machines is important, and the above suggestions should help you narrow down your choices and choose a service company that is right for you. If you would like to contact Maximum Vending to ask questions or tell us about your vending needs please call us at (505) 980-6764. We look forward to hearing from you!